Coming up with a name for a musical act is never an easy task. I’ve toyed with using superpapa67 for this purpose but I’m not entirely comfortable with it. It’s a pseudonym and I use it on this site partly to keep my songwriting identity separate from the rest of my life. 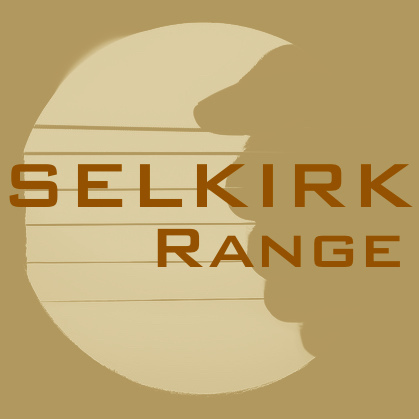 In looking around for another name I could use, I finally settled (at least for now) on “Selkirk Range”. The name is inspired by the Selkirk locomotive that was used to pull heavy trains through the difficult Rocky Mountain passes, and in particular the Selkirk Mountain Range. I’ve seen these things and they are impressive (both the locomotive and the mountains). I like the name for that reason and also because it invokes the West and my roots in Calgary and Edmonton. It hints at Gordon Lightfoot’s “Railroad Trilogy” and other Canadian traditions. I can connect with those sentiments. (And, a Google search suggests that nobody’s taken the name yet!) The image is an adaption of a wonderful photograph on Flickr by Matt Kaiser called “The Music Within (Silhouette)”. Matt has made it available as a Creative Commons license with a restriction on commercial use. The font is Bank Gothic. It’s evocative and plays in several dimensions: it’s an acoustic guitar from the inside out, it looks a bit like a weird crescent moon or eclipse, and it has a figure/ground effect with the light and dark depending on how you look at it.